The JANITOR'S ANSWER® excels in the effective cleaning of all hard nonporous surfaces including polyurethane floors, tile, linoleum, vinyl or finished wood. This formula contains no sulfonates, phosphates, caustics, NTA or other pollutants and cleans without leaving anything behind - like harsh chemical fumes. 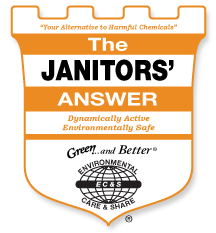 The JANITOR'S ANSWER® is a cleaner produced from alkaline water, manufactured by the WRJ-Ag-ROX EO Water Equipment, with a proprietary blend of surfactants, that takes the place of a wide range of harsh chemical cleaners. It is clear and nearly odorless, non-staining, non-flammable, and non-toxic. Extremely versatile, it can be used in hard, soft and salt water, and works well even in cold water. The JANITOR'S ANSWER® is 100% biodegradable in the environment in the optimum desirable time of 7 days. Substances that biodegrade too quickly are considered “bio-stimulants” and pollutants as cleaners: Substances that biodegrade in excess of 7 days are classified as “hard” chemicals and are hazardous to human health. The greatly decreased hydrogen ion concentration (high pH) and balanced ORP (oxidation/reduction potential – measured in milli-volts) of The JANITOR'S ANSWER® provides the necessary molecular energy for the maximum emulsifying and chelating action that is required to remove the oils, greases, protein, other substrate and invisible substances to which dirt, bacteria, fungus and algae adhere, and to remove carbon deposits and breaks down calcium and other scaling substances. Eliminating the need for protective clothing. Reducing the time necessary to train personnel in different product uses. Reducing liability associated with the use of hazardous and toxic products. WHAT CAUTIONS SHOULD BE CONSIDERED?